But what these people are doing, is to try to bypass the rational side of man and to appeal directly to these unconscious forces below the surfaces so that you are, in a way, making nonsense of the whole democratic procedure, which is based on conscious choice on rational ground. Below is a list of predictions made by speculative science fiction authors both past and present. Also listed is the novel or short story in which the prediction was made, as well as the year it was published. Bloggers aimmyarrowshigh and badguys have created this exceptionally accurate map of Panem, the world created by Suzanne Collins in her series “The Hunger Games “. 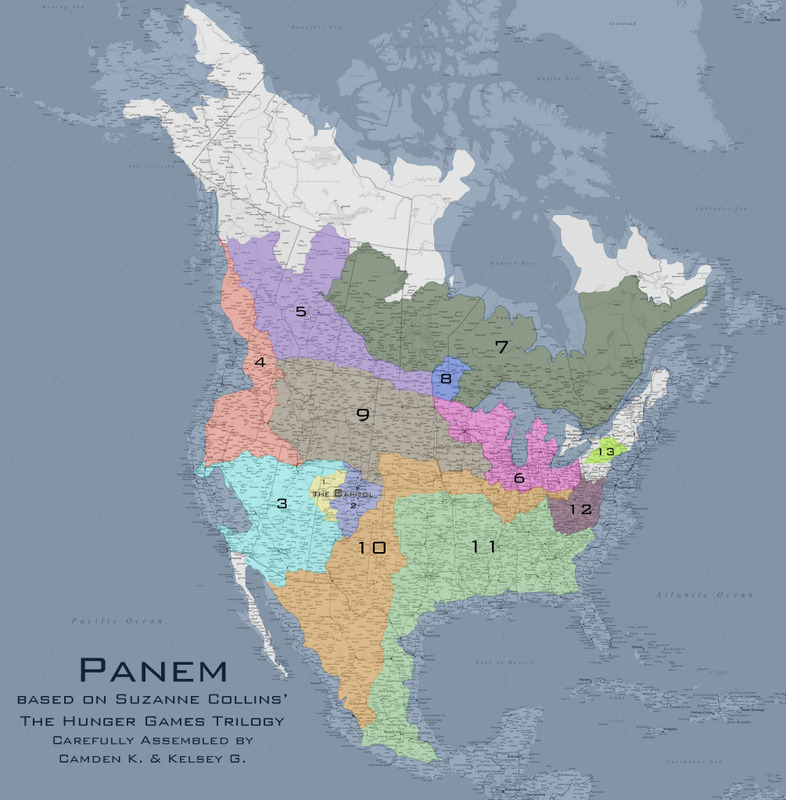 Panem is described being a North America that has been ravaged by war and geological catastrophes. D7 specializes in lumber. It’s probably large. It has no role in food processing or manufacture. D5 is entirely dependent on the Capitol, so it’s probably somewhat nearby, and specializes in genetic research and manipulation. Because of the necessity of creative thought and intellect, it’s most likely a smaller District so that it’s easier to monitor and control. D1 produces luxury goods for the Capitol — INCLUDING having a diamond mine. Kelsey Lake Diamond Mine is a defunct diamond mine in Colorado, USA. It is located in the State Line Kimberlite District, near the Wyoming border. D13 specialized in nuclear power, shares a border with D12, is both visible and reachable from D12 by foot, and is North of West Virginia. Three Mile Island was in New York Pennsylvania, and probably remained a nuclear reactor or was co-opted again as a reactor. D13 is small but mighty and is surrounded by Wilderness. It is self-sufficient. This information was combined with some speculation about the results of future cataclysmic natural disaster in order to reach the maps final result. Of course, to me, the most interesting aspect of the map is the Capitol is located in what is now Denver, Colorado. I like the idea of Denver being the future capital of the post-apocalyptic dystopia. 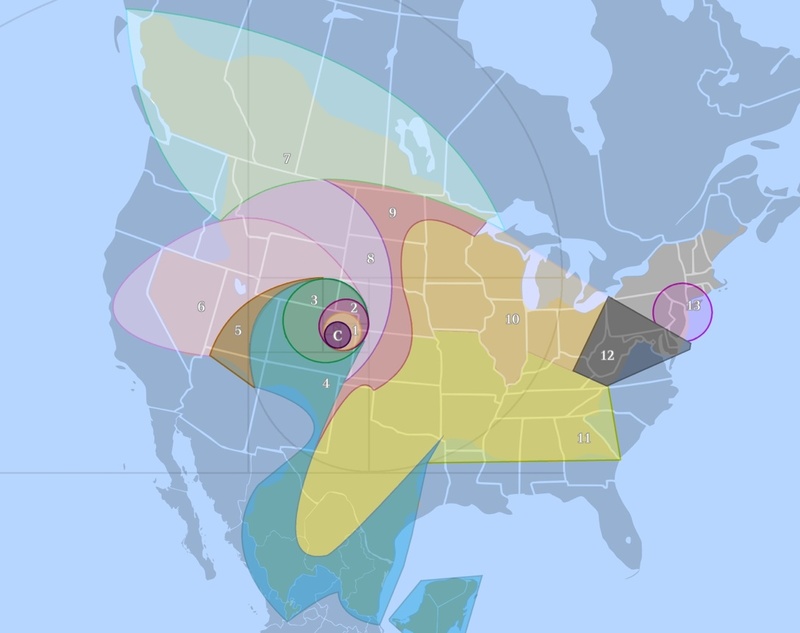 Additionally, I would be remiss to not include Nerd Friday’s version of the Panem map shown below. This arguably more accurate map places the Capitol near Grand Junction, Colorado. More information about Nerd Friday’s creation process can be found in the bibliography and referenced works as well as the frequently asked questions section. Below is a list of events, given present scientific understanding and models, that are expected to occur in the far future. Entities affected include humans, the Earth, the galaxy and the known Universe. Predictions include the fields of biology, geology, astrophysics, cosmology, and particle physics. It should be noted that several alternate future events are listed to account for questions still unresolved. 10,000 years from now – The end of humanity, according to Brandon Carter’s Doomsday Argument, which assumes that half of the humans who will ever have lived have already been born. 10,000 years from now – The Earth’s axial tilt reaches a minimum of 22.5 degrees. The Gregorian calendar will be roughly 10 days out of sync with the Sun’s position in the sky. 25,000 years from now – The Arecibo Message, a collection of radio data transmitted on 16 November 1974, reaches its destination, the globular cluster Messier 13. This is the only interstellar radio message sent to such a distant region of the galaxy. 50,000 years from now – Niagara Falls erodes away the remaining 20 miles to Lake Erie and ceases to exist. 100,000 years from now – Proper motion (the movement of stars through the galaxy) will make today’s constellations unrecognizable. 500,000 years from now – By this time Earth will have likely been impacted by a meteorite of roughly 1 km in diameter. 1 Million years from now – Highest estimated time until the red supergiant star Betelgeuse explodes in a supernova. The explosion is expected to be easily visible in daylight. 10 Million years from now – The widening East African Rift valley is flooded by the Red Sea, causing a new ocean basin to divide the continent of Africa. 230 Million years from now – The solar system reaches Lyapunov time and the orbits of the planets become impossible to predict. 240 Million years from now – From its present position, the Solar System will have completed one full orbit of the Galactic center. 250 Million years from now – All the continents on Earth fuse into a possible new supercontinent. 600 Million years from now – Tidal acceleration moves the Moon far enough from Earth that total solar eclipses are no longer possible. Carbon dioxide levels in its atmosphere decrease to the point at which C3 photosynthesis is no longer possible. 99% of all plants will die. 1 Billion years from now – The Sun’s luminosity increases by 10%, causing Earth’s surface temperatures to reach an average of 47°C and the oceans to boil away. 5.4 Billion years from now – The Sun becomes a red giant. Mercury, Venus and possibly Earth are destroyed. During these times, it is possible that Saturn’s moon Titan could achieve surface temperatures necessary to support life. 7 Billion years from now – The Milky Way and Andromeda galaxy collide. 14.4 Billion years from now – Sun becomes a black dwarf as its luminosity falls below three trillionths its current level making it invisible to human eyes. 20 Billion years from now – The end of the Universe in the Big Rip scenario. 50 Billion years from now – Assuming both survive the Sun’s expansion, by this time the Earth and the Moon become tidelocked, with each showing only one face to the other. 100 Billion years from now – The Universe’s expansion causes all evidence of the Big Bang to disappear beyond the practical observational limit, rendering cosmology impossible. 1 Trillion years from now – Low estimate for the time star formation ends in galaxies as they are depleted of the gas clouds needed to create stars. Once star formation ends and the least massive red dwarfs exhaust their fuel, the only stellar-mass objects remaining are stellar remnants (white dwarfs, brown dwarfs, neutron stars and black holes). 2 Trillion years from now – All galaxies outside the Local Supercluster are no longer detectable in any way, assuming that dark energy continues to make the Universe expand at an accelerating rate. 1015 (1 Quadrillion) years from now – Estimated time until stellar close encounters detach all planets in the Solar System from their orbits. The Solar System will no longer exist. 3×1043 years from now – If protons decay, this is the estimated time for all nucleons in the observable Universe to decay. The Black Hole Era, in which black holes are the only remaining celestial objects begins. 1065 years from now – If protons don’t decay this is the estimated time for rigid objects like rocks to rearrange their atoms and molecules via quantum tunneling. On this timescale all matter is liquid. 101050 years from now – Estimated time for a Boltzmann brain to appear in the vacuum via a spontaneous entropy decrease. 101056 years from now – Estimated time for random quantum fluctuations to generate a new Big Bang. 101076 years from now – All matter collapses into black holes, again. Current theories suggest that the Universe is open, and thus will not collapse in on itself after a finite time. However, the infinite future potentially allows for the occurrence of a number of massively improbable events, such as the formation of a Boltzmann brain. A more complete list from which the ones included here were taken can be found on Wikipedia. Philipp Lessen’s blog, “Blogoscoped”, has a scary (and tongue-in-cheek) entry about what he thinks accessing the internet could be like in the year 2025. Many content offerings depend on the internet you’ve signed up to. If you’ve signed up with the GoogleAppleAmazon Internet, then you have one-click access to a great digital library, many movies, as well as a certain approved set of homemade web pages. If you’ve signed up with the DisneyWarnerBrosViacom internet, you get a different digital library, set of movies, and approved homemade web pages…Are you single and looking for the right partner? Based on your biometric data, your income, your location, as well as the Overall Attitude (OA) results from your Internet Surfing License, anywhere from 10-100 people in your area will be suggested to you. You may have noticed (although it takes a keen eye) a countdown clock added to the “about me” section. Yeah, over there in the right hand column. Well, I have determined I have to get everything I am ever going to accomplish finished before that timer runs out. In true Owen Meany style I have predetermined the date of my death. Sunday July 19th, 2054. 7:30 P.M.